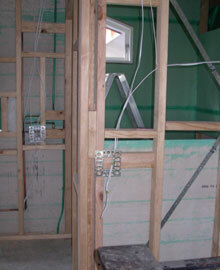 Bathroom Renovation – It looks like the bathroom is going to be finished ahead of schedule! If only the rest of the house could be completed as quickly, then we could escape the confines of our tiny – possibly shrinking – caravan. It was definitely the best idea moving out. Now that we are no longer underfoot, Jeff and the team have been working faster than ever. Even a bit of rain hasn’t slowed things down. I had a pretty good idea about the layout of the upstairs bathroom and worked with Jeff getting the design right. Even though storage is one of my main priorities, I had to sacrifice the old linen closet. This was positioned at the top of the stairs and behind that was the tiny bathroom. We decided to swap the linen closet for more bathroom space. Upstairs storage for towels and bed sheets could now be a bit of a problem, but we’ll just have to live with it. It seems like everyone was a lot shorter when houses were designed in the 1960s. Our bath was tiny, and the ceiling above the shower was so low, Frank kept whinging that he could hardly stand up straight, let alone wash his hair. We solved this problem by swapping the fittings around. The wall between the bathroom and the separate toilet was demolished. Where the old toilet was positioned is now the shower stall and where the old shower stall was positioned is now the toilet. I can already see that this formation is going to work much better. However, by far the best idea we had was to lift the ceiling to create more headroom and allow in plenty of natural light. It was incredible when we walked in to check it out. It was little weird because the roof was just a tarp, but it already feels like a mini-spa. Combining the separate toilet and bathroom has also given us more room for a larger bath. Haven’t chosen it yet but it’s going to be big and beautiful. My only concern is with the house next door. They have two storeys, and I’m a bit worried that they’ll be able to look straight into our bathroom. But I’ll trust Jeff – he’s confident that we’ll still have enough privacy. 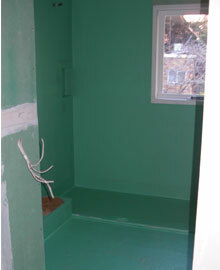 By having the design finalised in advance, we were able to get the bathroom waterproofed earlier than expected. This was the plumber’s job, and he also fitted everything for the new toilet, shower and taps. Finally I was able to ‘see’ our new bathroom and I liked it – a lot. Meanwhile we’re still surviving in the caravan. Mum’s gone beyond the call of duty and makes dinner for us virtually every night. Not to mention tea and biscuits when I get home from work. Dad’s even said that he’ll come and help us fix the backyard once the builders are finished. I’ve already ordered the tiles – wait til you see them! – and I was getting all excited. Jeff burst my bubble when he told me that we’ll have to wait for about a month until the tiler is called in. Jeff needs to replace the new wall first – where the old linen closet used to be and have the downstairs bathroom prepared so all the tiling can be done at once. The only glitch was a slight measurement problem. Thankfully it wasn’t my mistake! I’m not exactly sure how it happened (something to do with the width of a demolished wall not incorporated into a set of measurements). The outcome meant that the shower door would have to be a little less wide and it could be tight getting in and out of the shower. Jeff – believe it or not – admitted that he forgot all about it. He was prepared to rebuild if necessary, but to be honest, I don’t think it’s worth it. 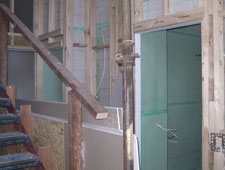 I reckon we’ll still have enough space to access the shower enclosure, and I didn’t want to put the project any further behind. Work will start on the downstairs bath soon. It’s just a toilet, vanity and shower but will come in very handy when the main bathroom is occupied (95% of the time!). The only minor problem is that the bathroom window also looks over the neighbours’ driveway. I’ll definitely have to get Dad here to do some serious screen planting outside. I wouldn’t want the neighbours to see my hairbrush-as-a-microphone, mirror-as-the-audience performance as I’m getting ready for work!